During Yan Liang and Wen Chou's drawing phase, they can choose to not draw. Instead they perform a judgment. The card is then put into their hand. For the rest of their turn, all of the opposite colored hand cards can be used as duel. The judgement card flipped during the "Dueling Heroes" ability is subject to judgement tinkering by Zhang Jiao and Sima Yi. The final judgement card still goes into Yan Liang & Wen Chou's hand. If Yan Liang & Wen Chou are the victim of Starvation, they cannot activate their ability. Yan Liang and Wen Chou can do a large amount of damage in a short amount of time with "Dueling Heroes." In addition, they are not hassled with attacking range restrictions for this power. Yan Liang & Wen Chou's "Dueling Heroes" lasts for their entire turn. This is great if the duo are able to get more cards in their hand. Yan Liang and Wen Chou have no defensive options. "Dueling Heroes" only allows the duo to draw one card per turn on the turns that they wish to use their ability. Of course, it is not necessary to use this power each turn (doing so would be very unwise), but electing not to do this power robs the pair of having an advantage over other characters. Guan Yu/Lu Bu/ Zhao Yun - These characters' abilities help them in duels and they would have an easy time repelling Yan Liang & Wen Chou's assaults. 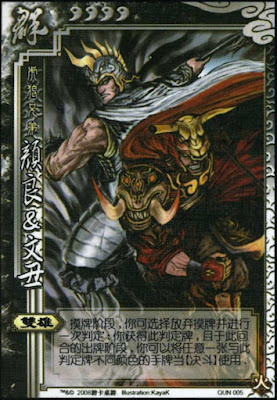 Zhang Liao/Zhang He/Gan Ning - These characters specialize in card destruction and can make it difficult for this duo to store enough cards for their turn. Lu Su/Liu Bei - These characters can give this duo more cards during their turns, allowing "Dueling Heroes" to be more effective. Xun Yu/Guo Jia - This duo can duel these characters who can give the pair more cards during their turn. This is great, since "Dueling Heroes" lasts throughout the entire turn. King These two do not make for a good king. A king needs to have defensive abilities, which is lacking in this case. Loyalist These two can make a good loyalist. They can pick off the rebels one by one and gain additional cards for their power in the process. Rebel These two make a great rebel. They can reach the king from any distance with "Dueling Heroes." This power is great against Zhang Jiao and Liu Shan, who both have defensive abilities activated when they are under attack. "Dueling Heroes" allows the pair to duel the king, bypassing the defensive abilities. Spy These two do not make a good spy. The spy needs be able to keep a low profile and last for a long time, two things that this pair cannot do. These two are a powerhouse. They can end the game quickly if they are lucky, but they are not built to last. For the best chance of winning, they need to have characters on their team that can refill their hand.